Russell Hobbs Coffeemaker Review - Most beautiful coffee maker? Check out customer reviews of this Russell Hobbs coffee maker. Most customers very positively talk about the beautiful retro look. The biggest customer complaint is that the price could be a bit lower. 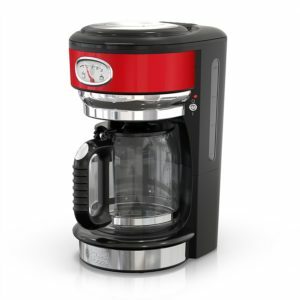 Our brief review: if you want coffee maker that will make your kitchen more beautiful then is Russel Hobbs retro red coffee maker is great for you. Most people would say that “every coffee making machine is pretty much the same”, but then not every one of them tried using Russel Hobbs Retro Style Coffeemaker. To the “innocent bystander,” most of these coffee machines look the same. After all, only those who really like to make their own coffee and enjoy it are truly able to spot the difference between this and that coffeemaker. Some of these really look good sitting on your table but then “drop the ball” when it comes to providing you with good beverage. Some coffeemakers actually make a good coffee but are really dreadful to the eye and even hard to maintain. Still, there might be something in store for you that could attract your attention. Who doesn’t love retro style? Having a piece of furniture or appliance that reminds you of the good old times (with style) can really refresh the looks of your kitchen, living room or the entire apartment. After all, even the popular culture started promoting the style of “atomic era” (if you don’t believe me, watch “Sin City” or play games like “Bioshock” or “Fallout”). If everything can go “retro”, why wouldn’t a coffeemaker do so too? Russell Hobbs Retro Style 8-Cup Coffeemaker has that old-school sharp looks that will instantly make you fall for it. Made out of high-quality red stainless steel, this machine doesn’t only look great, it is also built to last. Plus, its rounded-edge design makes a nice fusion of the modern and the old. Simply put, this appliance will most likely be the prettiest thing on your kitchen countertop. What else does this Russell Hobbs coffeemaker have to offer? Although it looks like it came back “straight out of the 50’s” Russell Hobbs coffee maker is actually packed with new technologies. It brews coffee fast and easy. There are no complicated options because this one was made to be 100% “user-friendly”. This means that everyone can handle it with ease. Another thing that makes this appliance great (and this is something that you won’t find on just every machine of this type) is that Russell Hobbs Retro Style 8-cup Coffeemaker is safe to use. “What threat could coffeemaker pose to me,” you ask. Well, just think about the fact that its steam vents are positioned far back in the rear so you won’t be scalding yourself unintentionally. Thanks to its rubber feet and weight, this appliance is not easy to slide or move while you tinker with the glass carafe. Also, this coffeemaker is really hard to knock over. 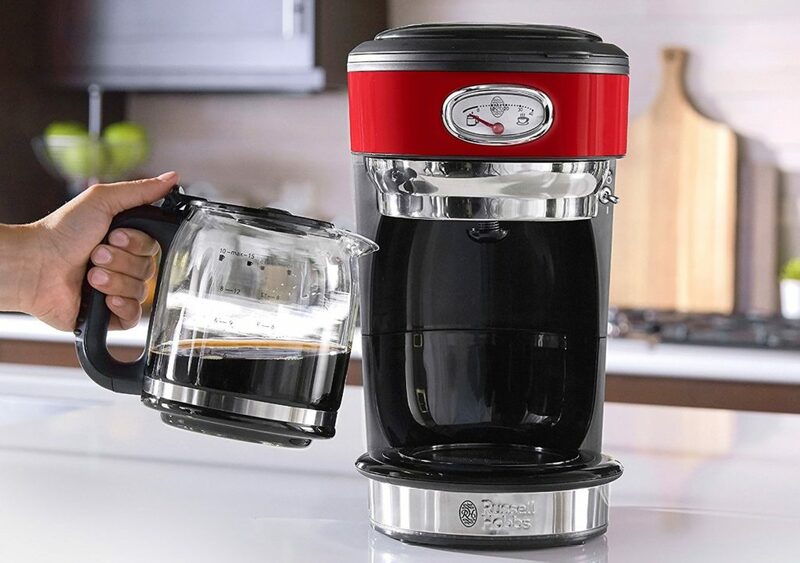 Another great thing about Russel Hobbs Retro Style 8-Cup Coffeemaker is that it contains a large glass carafe that holds up to 8 cups of coffee. This is one more reason for you to share the joy of having this great appliance with someone else. Plus this carafe has auto shutoff. There is a water level indicator that helps you keep track of the amount of water that you have left to use. You can also clean this coffeemaker’s permanent filter basket. It is removable and completely washable. One of the best things that this machine has to offer is its highly-innovative showerhead technology. By constantly “bombing” the coffee stored inside with hot water, this showerhead extracts the full flavor from it during the brewing process. Honestly speaking, this technology is greatly praised by all coffee users who have ever tried their favorite brew made this way. Most of the coffeemakers (especially the old ones) can cause you lots of trouble while you pull out the carafe during the brewing process. Russel Hobbs Retro Coffeemaker has a “pause and pour” feature. This means that you can pull out the carafe anytime you like and it won’t affect the machine. It will stop. When you put it back, the brewing process will resume. Sound really neat, doesn’t it? Also, you don’t need to bother with choosing the right spoon to precisely measure the amount of coffee that you are going to use. This handy appliance also contains integrated coffee grounds spoon that will help you do this right. Right above the carafe, you will see the coffee brewing process gauge. It doesn’t only show the time left for the brewing process to be complete. The coffee brewing process gauge also shows how long the carafe warming plate was active. With this option now available to you, you will always know if your coffee is fresh or not. If you want to buy a really nice-looking and stylish retro coffeemaker that literally always delivers a hot and flavorful cup of coffee, you should have one of these. Its efficient brewing techniques always make sure that your brew has a good, solid taste. And, like we said before, it is very safe to use, even in the crowded kitchen. Its only setback might be the price (cheaper coffee makers – all under $ 50) , but when we take a look at this Russel Hobbs coffee maker and all the options that it has to offer (Again plus its smoking hot design), it doesn’t seem to sound unreasonable at all, right? Note: Maybe today Coffee Supremacy team write not too realistic Russell Hobbs Coffeemaker Review. We fell in love in this coffee machine. Today we’re superficial because we are physically attracted. We not look deep to the coffeemaker “soul” 🙂 But again just take another look. I’m thinking of buying this product it’s so beautiful, but it does not say anywhere, what temperature the ready coffee drink is. Should be around 92-96 C.
Coffee temperature is around 185 F (or 85 C) and that is hotter than mostly cheap coffee makers which prepare coffee on 150 F (or 65 C).